Can’t seem to handle all those greens? Then this DVD is just for you. 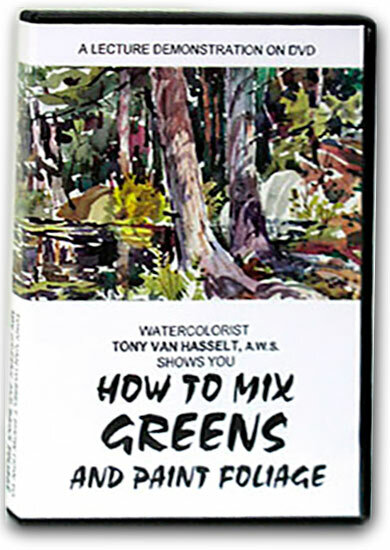 As a landscape painter, it is impossible to avoid using green, so why not learn how to make those green mixtures more natural, varied and interesting? 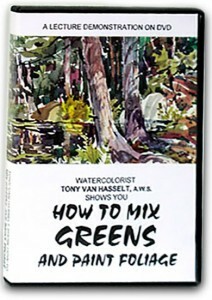 In this DVD lecture, I show how this is done, starting with most colors on your palette and adding just the right amount of green. Look over my shoulder, to observe how those delicate spring greens or deep purple greens are made, thereby adding variety to those foliage areas. Over and over, you’ll hear me say “Forget the recipes and vary your mixtures”. I encourage you to make those variations and at the same time explore painting negative space. Learn to paint positive and think negative to come up with interesting tree effects, often suitable for framing. In addition, I’ll show the many ways a brush can be used and manipulated. You’ll learn to twist, twirl and “go against the grain” for special effects, impossible to get any other way. $20.00 includes mailing in the US. $30.00 includes mailing and handling on international orders.